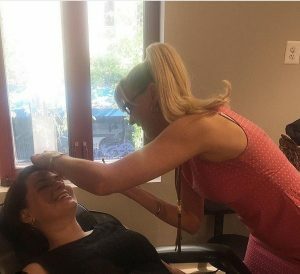 If you are looking for a way to brighten your look without adding any cosmetics to your routine, consider Eyebrow Tinting, Eyelash Tinting, or Eyelash Extensions. Beach days are less smudgy & mornings are easier when your brows & lashes have that extra emphasis that really make them look their absolute best. 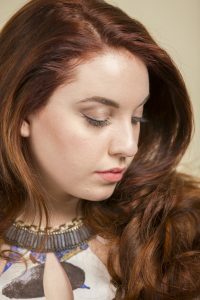 Tips of Lashes & Brows are naturally lighter, so tinting will add a sense of length & fullness. For eyebrow & eyelash tinting, Sherry uses RefectoCil, a vegan color line that was started in 1930, Austria. 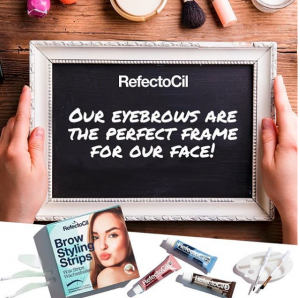 RefectoCil’s company philosophy is passionate about contributing positivially to the cosmetics industry’s growth, in a socially & stylishly-aware way. Eyebrow & Eyelash Tinting lasts around 6 weeks: this number really depends on the amount of sweating, showering, & face washing you do. To shape eyebrows, Sherry uses a combination of plucking & waxing. The wax we prefer is a creme-based, sensitive wax for all skin types. Our stylists are specialists in Babe Things Eyelash Extensions! Eyelash Extensions are the best way to get longer, fuller lashes without any cosmetics or commitment. Eyelash extensions are an investment which require upkeep (refills every 3 weeks) but the payoff is in your lashes being long, thick, & perfect, just like you’ve always wanted.